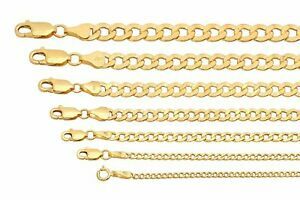 Details about BRAND NEW 10k Yellow Gold 2mm-7.5mm Cuban Curb Link Chain Necklace 16"-30"
14kt Solid Gold 18 inch Solid Figaro Chain - Lobster Lock 100% Guaranteed! awesome seller ,great communication, timely shipping and great quality product ! Excellent! Thanks so much! Came faster than expected!! As described. My wife loves it. Got it today I love it! I'm wearing it! Thank you hope to do more business! Couple days late but seller was in contact the whole time.